That idiosyncratic smell of cardboard, cheap wood and plastic that rushes out when I remove the box's cover. The instant gratification of unfolding the board into the sweet spot of the table, smoothing it out into the perfect receptacle for a heated battle of wits. Digging in the crinkled gray bag, feeling the smoothness of the wooden tiles, wondering what they'll test me with today. The lightness of my wooden rack, weighed down with endless possibilities that challenge my mind. A chilled Hoegaarden in one hand as I concomitantly and strategically place my letters onto the board. Divulging to my friends, my opponents, the definition of an odd word, the details of an awkward term, or the sound of an onomatopoeic spelling. Although I do get my fix at least once a week, usually during a game night with friends, it's not enough. It's not like it used to be. 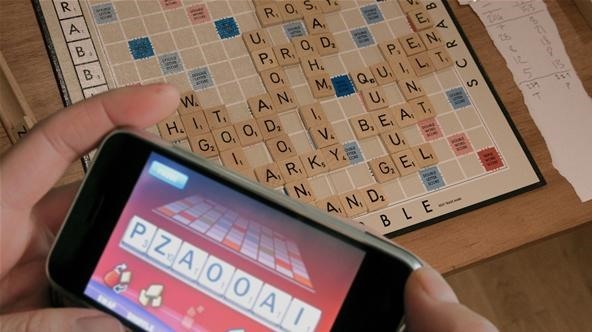 Today, SCRABBLE is a different being and it lives in the belly of electronic devices. Mobile phones. Table computers. Portable media players. It's gone virtual, and in order to satisfy my craving, I had adapt. The virtual world of SCRABBLE is great for instant gratification, for a quick fix, for challenging one's self, but it will never replace the atmosphere of friends, brewskies and stiff competition. Alas, all of my friends are converting to online SCRABBLE, because of busy schedules, expensive gas prices, or fascinations with their new electronic gadgets. So, it was either quit cold turkey or jump on the bandwagon, and I don't want to hear the music stop just yet. But with online SCRABBLE becoming more popular than the classic, hands-on board game, cheating is also becoming more popular. But is it really cheating? The answer: It depends on who you're playing and why you're playing. 8. Any play may be challenged before the next player starts a turn. If the play challenged is unacceptable, the challenged player takes back his or her tiles and loses that turn. If the play challenged is acceptable, the challenger loses his or her next turn. Consult the dictionary for challenges only. All words made in one play are challenged simultaneously. If any word is unacceptable, then the entire play is unacceptable. Only one turn is lost on any challenge. But with online gameplay and mobile devices, consulting a dictionary without your opponent's knowledge is not only possible, it's easy. Not to mention that some of these SCRABBLE games actually have an available dictionary built right in. Hasbro's SCRABBLE application, developed by EA, is available for the Apple iPhone, iPod, iPod Touch, iPad, Facebook, Pogo, PSP, Nintendo DS and iGoogle. Each of these versions has that built-in dictionary, which you can use to find legal words while playing a virtual game. On some of these versions, you can simply look up a word to see if it's valid. Not only that, but you can play an invalid word on the board (multiple times) without penalty, which means you can simply try, try and try again, until you hit a valid. Doesn't this seem to break those official SCRABBLE rules, which state to "Consult the dictionary for challenges only"? I guess that's why there aren't any options for challenges. So, since all of these games are branded with the Hasbro logo, does this mean that they condone cheating now? My personal opinion is that this is indeed cheating. It's not how the game was originally intended to be played, which makes it unchallenging, to say the least. If you're playing a game against a random opponent, then the unsaid rule is to not refer to online dictionaries or word finders. Basically— play fair. If you're playing a game against someone you know, a friend, a family member, whatever, then "it depends on who you're playing," as long as you both agree on the rules beforehand. So, now for my slightly hypocritical reasoning behind "it depends on why you're playing." If you're playing with the sole intention of improving through practice, then using these options are perfectly fine, as long as you respect your opponent. Again, you should "not refer to online dictionaries or word finders" while playing against any unknowns, but if you agree upon dictionary use beforehand, then it's perfectly fine. Even better, playing against artificial intelligence (i.e. the computer) is a respectable way of improvement, and can help your SCRABBLE vocabulary and your word building skills on the board. I know I shouldn't be doing this, but here's a list of decent SCRABBLE solvers and word finders that could help you improve. Get that? Improve— not cheat! This is one of the more attractive sites on the Internet. 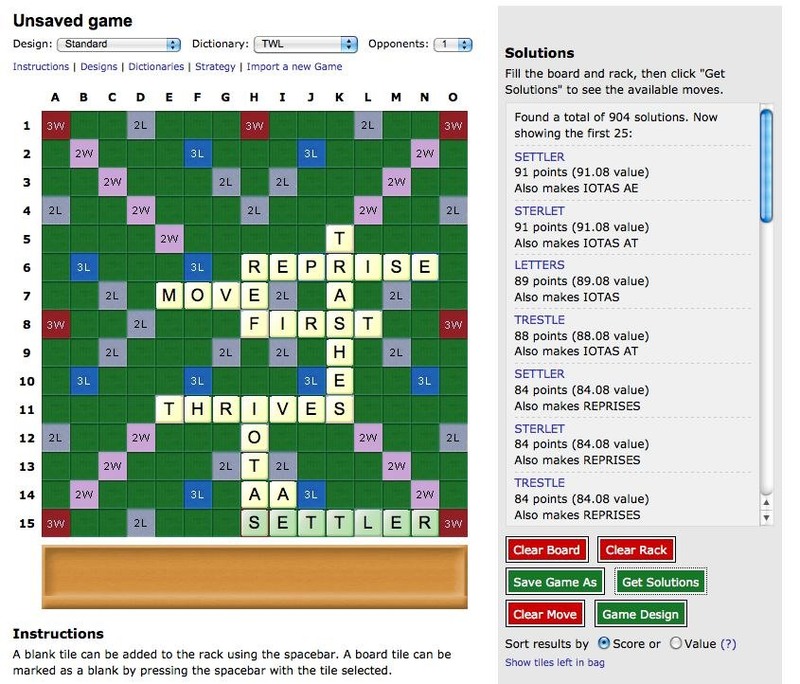 It's available at Scrabble Cheat, and there's multiple tools to help you play better. 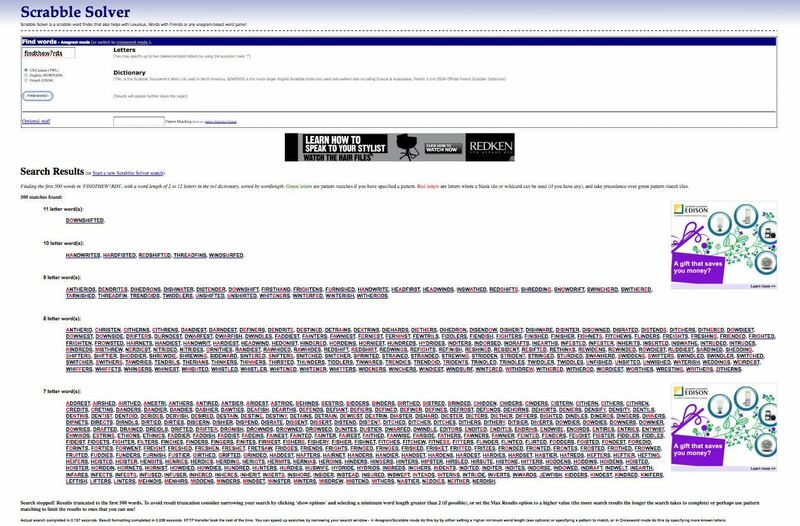 Although the site's name has "cheat" in it, and they explicitly state "You will find anything you want to cheat and solve scrabble puzzle," I wouldn't recommend you take it to heart. 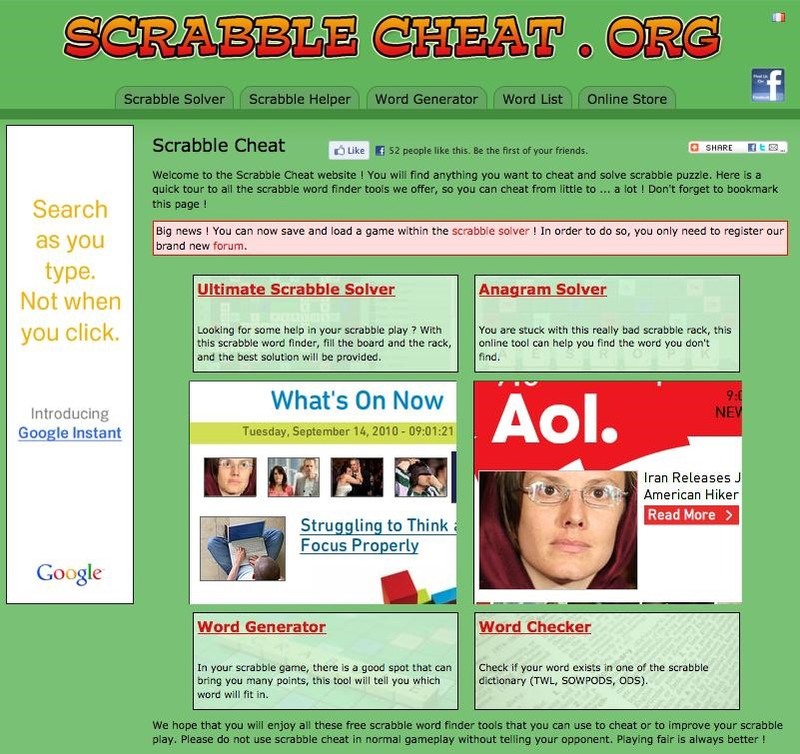 The site was actually designed as a training tool, despite the word "cheat" in the name. Use it as a tool, not a weapon. 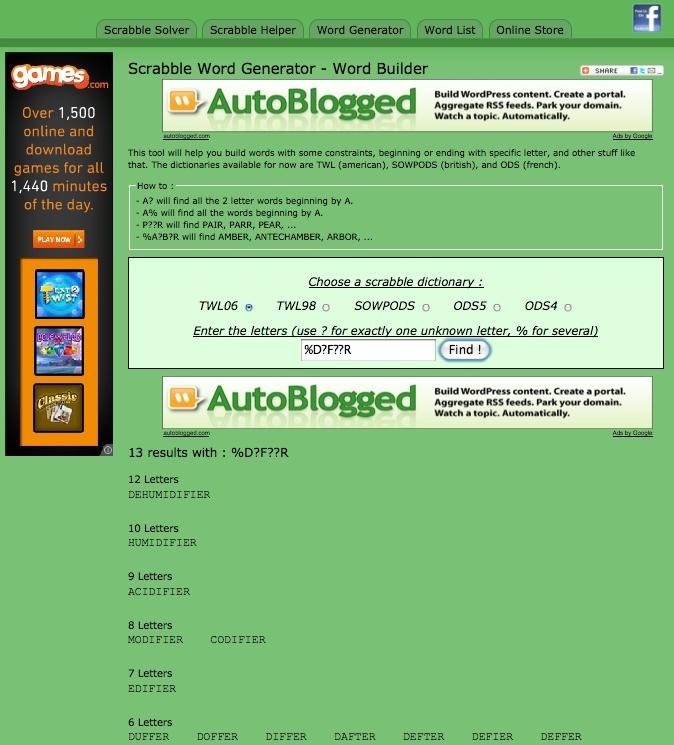 The multiple tools available are the Ultimate Scrabble Solver, Anagram Solver, Word Generator, and Word Checker, along with a Word List. 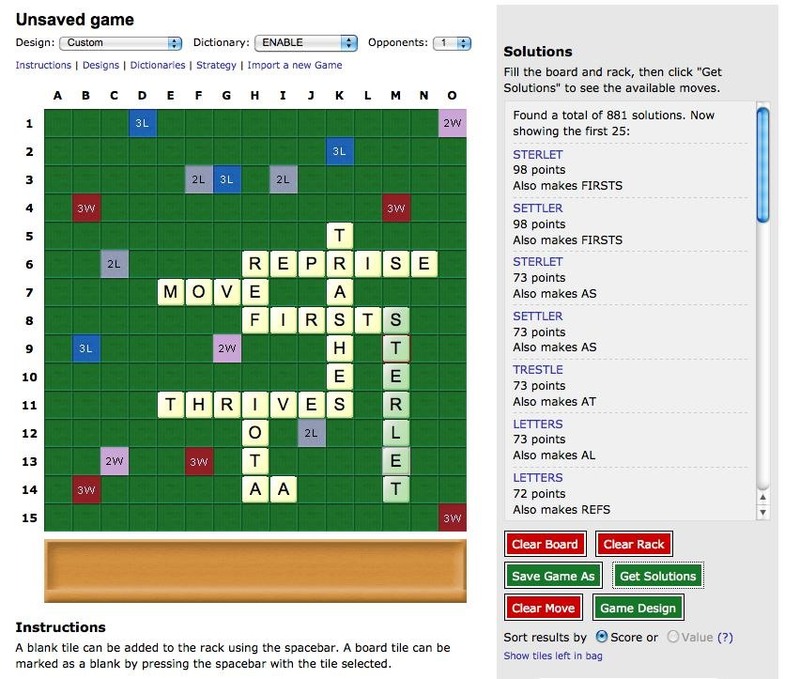 The Ultimate Scrabble Solver can mimic the board layout of SCRABBLE, Lexulous, Literati and Wordscraper, and for dictionary options, you have ODS4, ODS5, TWL98, TWL06 and SOWPODS. It will tell you every possible option for your rack, ranking the words from highest points to lowest points. 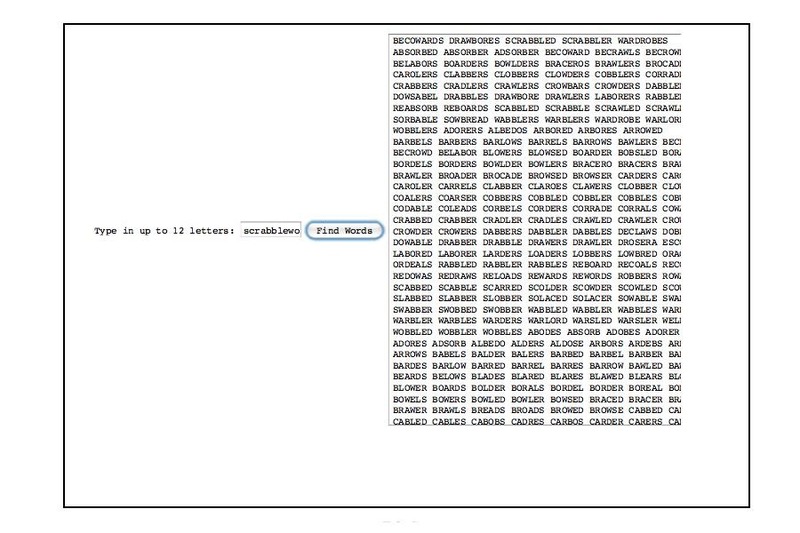 Anagram Solver simply tells you all of the possible words you have for the letters entered. Word Generator will help you find words using the guidelines you specify, like words beginning with "F" or ones starting with "B" with a third letter of "R". Word Checker is just a simple dictionary check. It does not supply definitions, just says whether or not your questionable word is or is not in the specified dictionary. The Word List just provides basic lists for learning new words. "Please use this scrabble cheat tool fairly. It is not our intention to encourage you to cheat on other people, but rather to give you the means to see what you could have done afterwards, and help you improve your game. So please, use this scrabble cheat tool wisely." 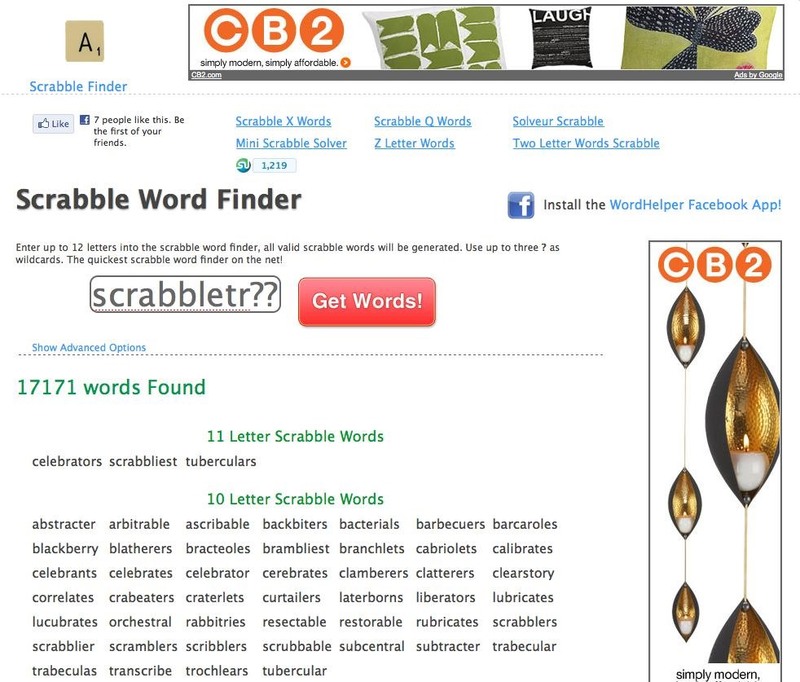 "We hope that you will enjoy all these free scrabble word finder tools that you can use to improve your scrabble play. 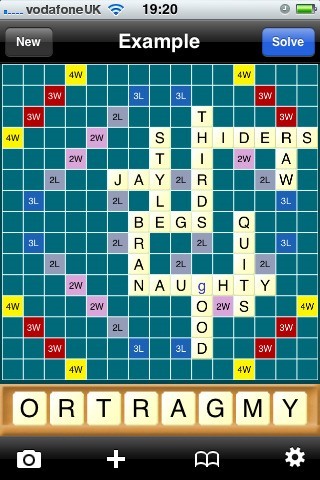 Please do not use scrabble cheat in normal gameplay without telling your opponent. Playing fair is always better !" No matter why you're using it though, just beware that this site is French-run, so not everything on the site is grammatically correct. If you see something that should be fixed, let them know in their forum or their Facebook Page. 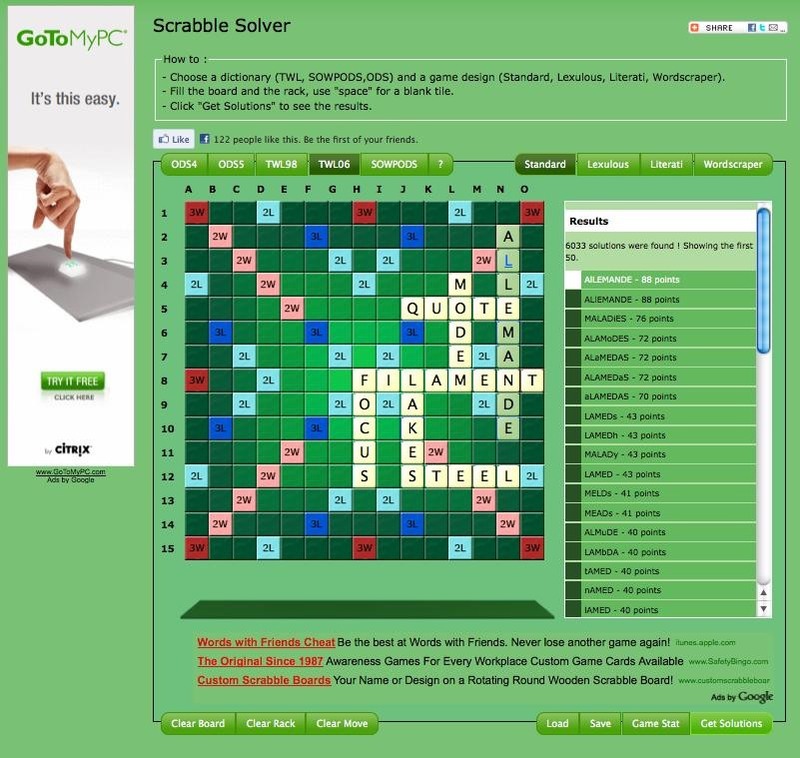 Scrabble Solver is a basic word finder, where you input your rack of letters and it finds all of the possible words contained. You can have up to 20 letters, two of which can be blanks (?). It finds words from 2 to 15 letters long, in your choice of the TWL (US/Canada), SOWPODS (English) or OSD4 (French) dictionaries. Plus, it has the 2- and 3-letter word lists for each dictionary, for easy reference, and you can click on each of these words to find definitions. 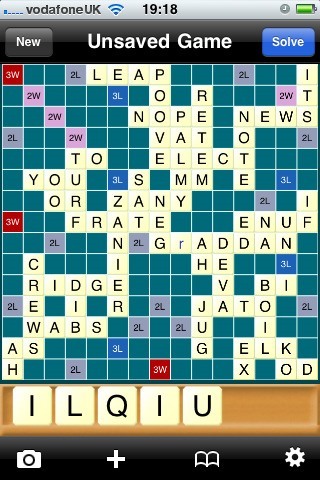 There are limits of Scrabble Solver, though. It automatically truncates the search results to 500 words, from longest-lettered words to shortest. However, you can adjust this by clicking on "Optional Stuff" and selecting how many words you want it to find (limit being 999). You can also narrow your results down to specifics, like if you want to find all the 5-letter words starting with F, you can do that via the "Pattern Matching" tool. And you can sort the results in chronological order or by word length. 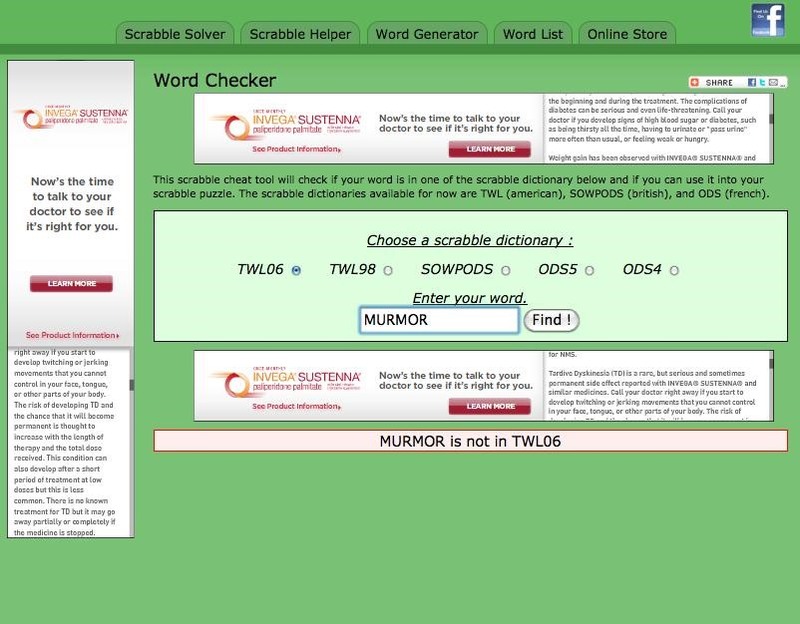 Another great thing — Scrabble Solver has mobile capabilities, for quick word searches on the go. 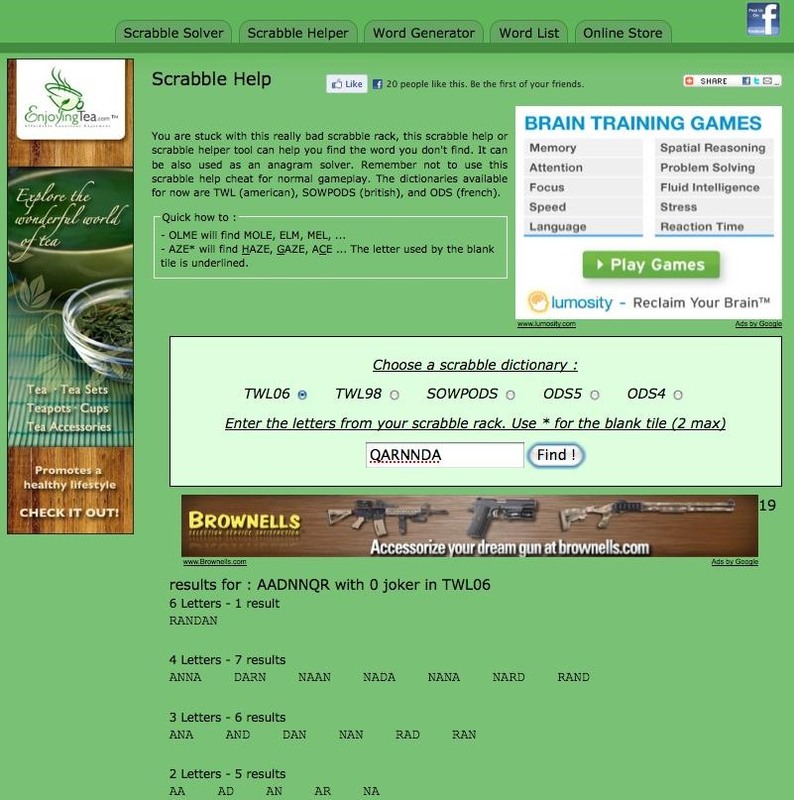 Like Scrabble Solver above, this site is simply designed, with many like tools. The Scrabble Solver on Adam Bozon's website can only find solutions for 2- to 7-letter words, with an allowance of 2 blank tiles. The Anagram Solver can find solutions for 2- to 12-letter words (no blanks). The Crossword Solver allows you to find 2- to 12-letter words with missing letters, i.e. A/A/RAM would find ANAGRAM, and only ANAGRAM. A cool feature that the other sites don't have is a Word List Maker. 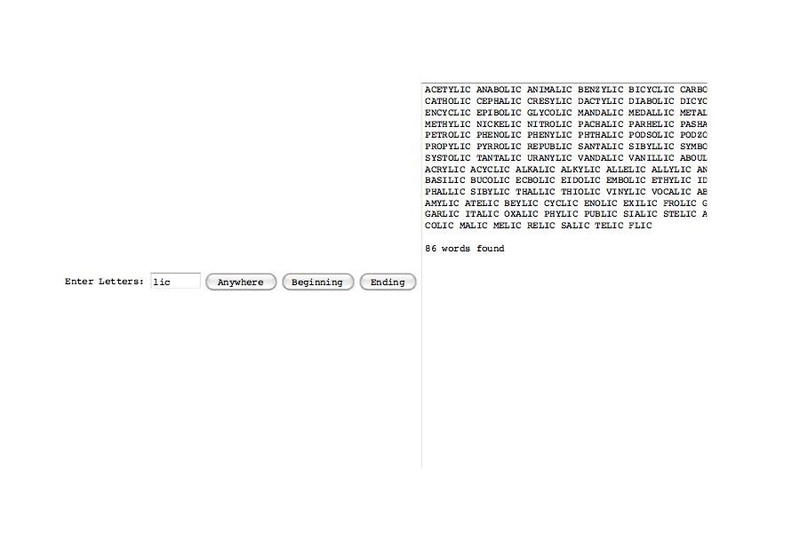 This is a great generator tool if you want to study, say, all the words ending in -LIC, like ANABOLIC or COLIC. It can only generate words from 2- to 8-letters long, so ALCOHOLIC wouldn't make the cut. You can enter up to 8 letters, appearing anywhere in the word, or just the beginning or end. Plus, there's a few word games that you can play, and links to other online word games. Some of these games are a little outdated, but the tools on this site are useful and simple to use, especially the word list generator. The Scrabble Finder website is a simple one— straight to the point. You enter up to 12 letters (2 of which can be blanks) and it returns a list of 2- to 12-letters words. It has an English version and a French version. Plus, it provides a "Mini" site that can open atop any browser window you have open, for instant word-solving access. There's also a few word lists available, which can also be found here. Scrabble Finder is great if you want something easy and accessible. 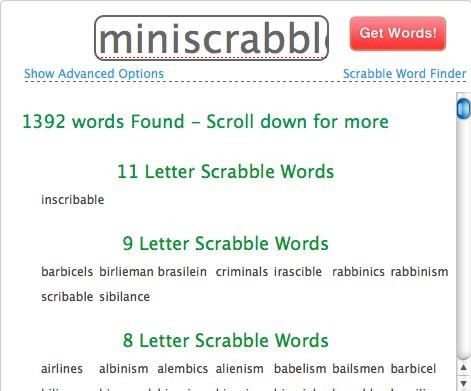 Scrabulizer is a "Scrabble Solver", just like all of the above, but it's actually better all around. It's more visually appealing, easier to use and customizable. 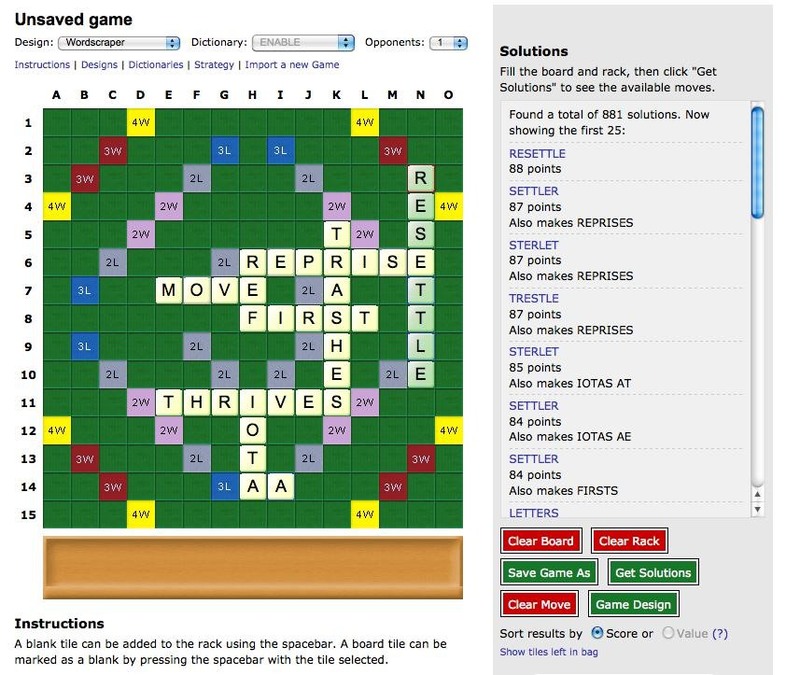 The solver can work with the standard SCRABBLE board layout, plus Lexulous, Literati, Words with Friends and Wordscraper. You can also customize the board for another word game, like Word Wise. There's support for all of the following dictionaries: TWL (Tournament Word List), SOWPODS (OSPD + OSW), OSPD (Official Scrabble Players Dictionary v4), ODS4 [French] (L'Officiel du Scrabble v4), ODS5 [French] (L'Officiel du Scrabble v5), Italian, ENABLE (Enhanced North American Benchmark LExicon), CSW (Collins Scrabble Words) and all of them Combined. You can also set up the board for 1-4 players. Results can be sorted either by score or value, score being the highest points possible and value being strategic placement of words (not necessarily score value). The best thing— you can save your game for future use (after creating an account). 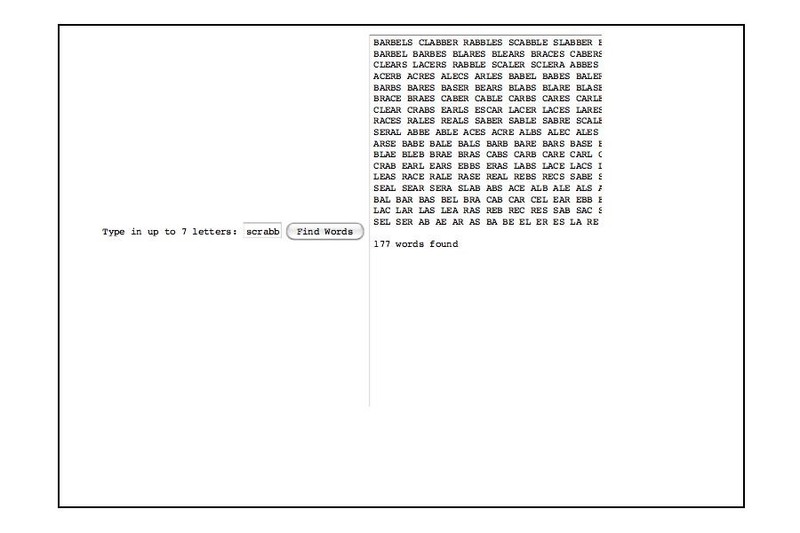 Overall, this is the best Scrabble Solver application on the web. There's also Scrabulizer for the iPhone, iPod Touch and iPad available at the iTunes App Store. There's a gazillion more Scrabble Solvers on the web, too many to go through, especially when the best ones are right here. If I were you, I'd just stick with Scrabulizer— but NO CHEATING! 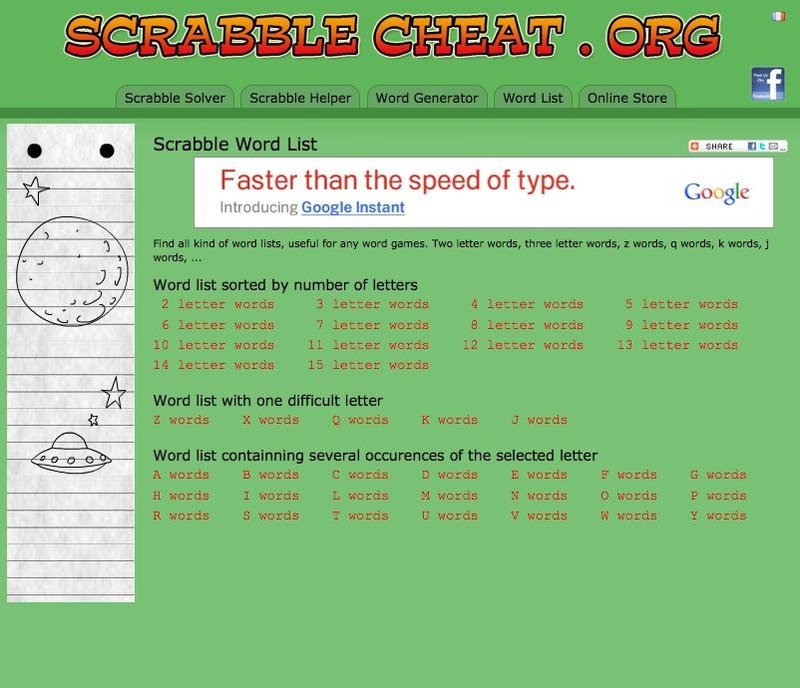 I send you a message about scrabblecheat.org, could you read it ? I would recommend http://www.word-grabber.com as well. It also has a growing stock of articles on word games and word trivia. 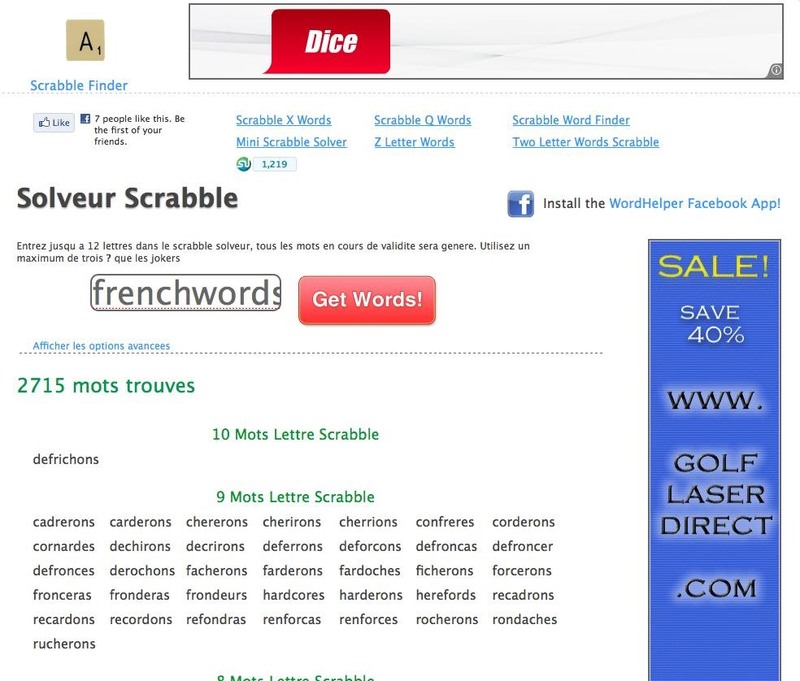 We currently added support for Wordfeud to the existing Scrabble helper and Words With Friends helper. Would love to read your opinion on that, because we are constantly improving the site.